Ever get that feeling of Doom-jà vu? Not content with releasing arguably two of the best games of the year with Legend of Zelda: Breath of the Wild and Mario Odyssey, Nintendo have released a version of last year’s gloriously gory Doom on the Switch. Now, this is nothing short of extraordinary, not only because Doom has the graphical demands to max out even the most powerful gaming PCs, but also because it’s Nintendo’s first foray into exclusively adult games for quite some time. I’ll prefix this section by saying I won’t be reviewing Doom itself (if you haven’t played last year’s version yet, do it, it’s up there with the best), rather I’ll be reviewing the experience of playing it on the Switch, which fortunately happens to be really rather good. Overall, the port over to the Switch is phenomenal, given the console’s lack of technical oomph; it still has the fluid, almost dance-like gameplay that works so well in creating a brutally visceral yet graceful adventure. What’s more, this isn’t a stripped down version of a game, as was the case with ports of triple-A titles on the Wii, instead expect all the features from its big brothers, including a full campaign and multiplayer to satiate hours of bloodlust. Doom also treats us to what could possibly be the best original musical score from any video game in the modern era. Mick Gordon arranges aggressive electronic beats with crushing guitar riffs to create the best soundtrack for ripping up hellspawn with a chainsaw. ‘BFG Division’ is definitely a highlight track, and one to add to any workout playlist. 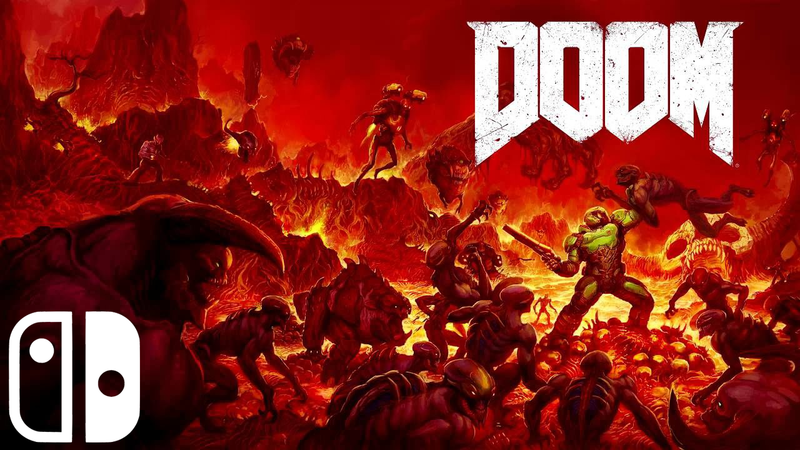 Ultimately, regardless of what platform you’re playing it on, what makes this game stand out is that it manages to recreate the magic of the original Doom, in all its frenetic, heart-pounding glory. As players of Duke Nukem: Forever will attest, this is no mean feat. With that being said, Doom on the Switch isn’t quite a perfect port. The limitations of the console mean you’re stuck with a 720p, 30fps experience, which in of itself isn’t an issue, particularly on the smaller tablet screen, however in the heights of intense battle, you may experience some serious lag problems. Not what you need when trying to keep the edge in multiplayer. Additionally, if you’re coming from last year’s console or PC versions, there’s not enough to entice players to fork out the cash again for what is essentially a downgrade. Ultimately, as good as the game is, you won’t find anything new here. Although not quite perfect, Doom on the Switch is better than it had any right to be; not only does it recapture the glory of the past, but with Skyrim and LA Noire also being remastered for the console, it signifies the dawning of a new age of adult games returning to Nintendo. I’ll steadfastly maintain that Legend of Zelda: Breath of the Wild is the best overall game of all time, but I would also argue that Doom is the best handheld game of all time.